A grey direwolf on a white field. That’s the sigil of House Stark. These indicators of allegiance are something we often associate with the medieval period (or medieval-themed TV shows). However, new discoveries in Israel suggest our use of sigils might stretch back into the stone age. Humans lived in Hayonim Cave, Israel, 40,000 years ago. This was before the hight of the last ice age, whilst our species was still spreading around the world. But all of those important events aren’t interesting. What is interesting is that several engraved shoulders have been found there1. The patterns of notches seen at Hayonim Cave. Many also show signs of being eaten. Talk about adding insult to injury. These shoulders share a striking similarity with discoveries from other sites in the region. Taken together, the researchers at Hayonim Cave inferred that these might represent some cultural identifier. A symbol of belonging to a particular group of people, much like sigils for the Starks1. 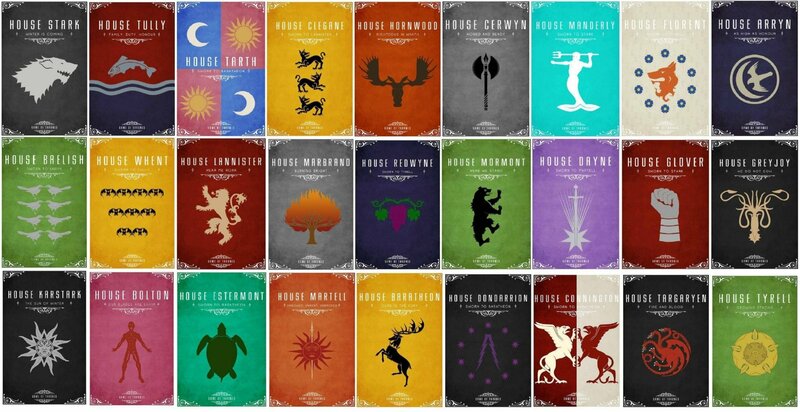 The sigils in question don’t feature any cool animal designs like in Game of Thrones. 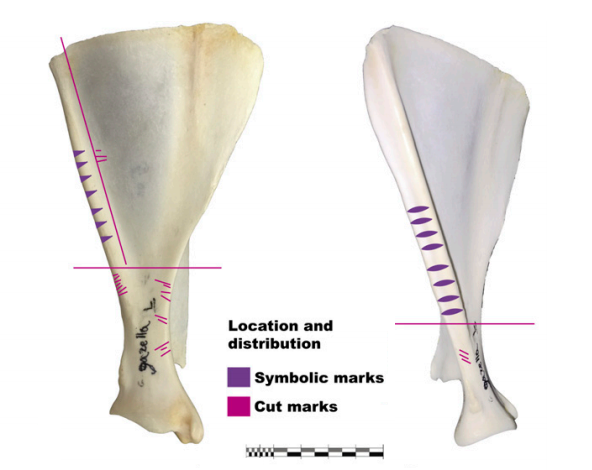 Instead, they’re a series of bones – typically gazelle shoulders – with notches carved into them1. Now, we have found these sorts of carvings throughout this period across Europe and the Middle East. However, they’re typically discovered in small numbers. Until the massive cache in Hayonim Cave, blew them all out of the water1. Ok, that might be a slight exaggeration. The archaeologists found 9 engraved bones there. But when most other sites only have a couple, 8 is a big deal. Plus, the sheer scale of the engravings is impressive. Some bones have more than 30 notches! This represents a fairly significant time investment. Not only did they go through the effort of making a ton of notches, they had to make the special tools needed to do so1. Crucially, this finding confirmed a pattern seen at by other sites in the region. For whatever reason, it seems that people living in the Levant made way more of these engravings than their counterparts elsewhere in the world. Manot Cave, also in Israel, contains another 4 of these engravings1. It was this pattern that led researchers to conclude that these engravings may have functioned as a sort of emblem or sigil, for humans living in the region at the time. There may have been other functions for these shoulders. Perhaps they were trophies taken from kills or tokens of favours someone owes. But by decorating them in a consistent way, they also serve to show group membership1. At 40,000 years old, Hayonim Cave may have the oldest sigils we know about. But for the rest of the stone age, it looks like others got in on the action too. Around the same time in Europe, for instance, archaeologists found distinct regional patterns in jewellery. Like the scapula sigils from Israel, they inferred that these might represent indicators of group membership. People with certain styles of jewellery were part of your group, so you could trust them. Armed with this information, they set about drawing up the apparent regions these groups occupied although the results of this have been contested2. A few thousand years later, something interesting begins to happen. 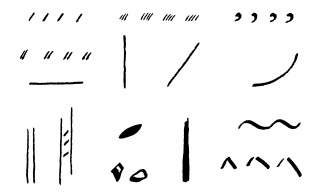 Like before, we see recurring motifs on cave walls3 and bones4 that might be indicative of sigils. Like the notches on our Israeli scapulas. However, a handful of sites appear to show many different engraving styles coming together. These have been termed “aggregation sites” and some say they represent groups from a wide area coming together and hanging out in one place. The timing makes this particularly interesting, as they often coincide with climate downturns3. (Although this inference rests on several assumptions, like that these engravings were made at the same time, and has thus been criticised by many4,5). Returning to our new Israeli finds, is there anything in the record of later sigils that helps clear up what’s going on Hayonim Cave? Well, since they’re putting effort into identifying an “us” with sigils, it implies there’s a “them” out there they don’t like. Or at least, view themselves as distinct from. Similar to how different regional groups made their own types of art across Europe (assuming you buy into all that). Who were these ancient humans trying to distinguish themselves from? Well, they may have been co-existing with Neanderthals at this time (or shortly before it). Perhaps they were using these sigils as a way to tell human from Neanderthal! Or maybe that’s all just wild speculation on my part. After all, can we really infer an enemy faction from 30 notches on an ancient scapula? Regardless of if you believe me (you shouldn’t) the fact remains that there’s something interesting going on in ancient Israel. And we’re just scratching the surface with these engravings. Tejero, J.M., Belfer-Cohen, A., Bar-Yosef, O., Gutkin, V. and Rabinovich, R., 2018. Symbolic emblems of the Levantine Aurignacians as a regional entity identifier (Hayonim Cave, Lower Galilee, Israel). Proceedings of the National Academy of Sciences, p.201717145. Kovacevic, M., Shennan, S., Vanhaeren, M., d’Errico, F. and Thomas, M.G., 2015. Simulating Geographical Variation in Material Culture: Were Early Modern Humans in Europe Ethnically Structured?. In Learning strategies and cultural evolution during the Palaeolithic (pp. 103-120). Springer, Tokyo. Clark, G.A., Barton, C.M. and Cohen, A., 1996. Explaining art in the Franco-Cantabrian refugium: an information exchange model. Debating Complexity, pp.241-253. Conkey, M.W., Beltrán, A., Clark, G.A., Echegaray, J.G., Guenther, M.G., Hahn, J., Hayden, B., Paddayya, K., Straus, L.G. and Valoch, K., 1980. The identification of prehistoric hunter-gatherer aggregation sites: the case of Altamira [and comments and reply]. Current anthropology, 21(5), pp.609-630. Clark, G.A., 1992, January. A comment on Mithen’s ecological interpretation of Palaeolithic art. In Proceedings of the Prehistoric Society (Vol. 58, pp. 107-109). Cambridge University Press.